LEONARDTOWN, Md. 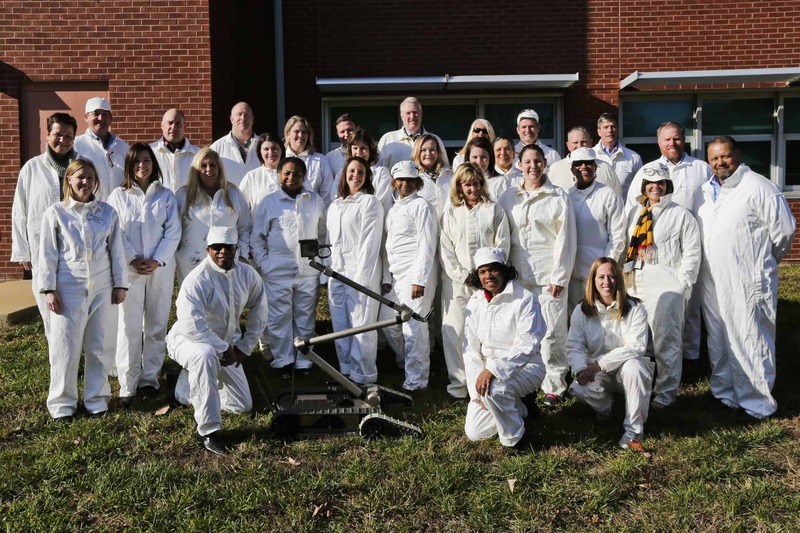 – December 15, 2017: On December 7, 2017, the Leadership Southern Maryland (LSM) Class of 2018 participated in the fourth of nine educational sessions for the 2017-18 LSM Executive Program – Defense and Industry. The one-day event began at the Town of Indian Head Pavilion, where participants were welcomed by Mayor Brandon Paulin and were introduced to sailors from the US Navy Color Guard stationed at Naval Surface Warfare Center (NSWC) Dahlgren. The class also learned about the Velocity Lab, a joint effort between NSWC Indian Head Explosive Ordnance Disposal Technology Division (IHEODTD) and the College of Southern Maryland to foster innovation, research, and development, and heard about how employers support the Maryland National Guard and the Military Reserves. Class members then headed aboard Naval Support Activity Indian Head where they received an overview of base operations from the host command. They were also briefed on the Chemical Biological Incident Response Force (CBIRF) and the structure and various missions of the NSWC IHEODTD. The morning wrapped up with a discussion about the Center for Industrial & Technical Excellence Partnership between NSWC IHEODTD and NAMMO Energetics Indian Head (NEIH) during which Scott Wilmoth, customer advocate for Air Applications at NSWC IHEODTD, and Keith Funkhouser, NEIH consultant for Propulsion & Armaments, fielded questions about how the command is partnering with private industries to create mutually beneficial relationships. The afternoon was segmented into tours of various NSWC IHEODTD facilities. Participants watched an explosive ordinance disposal (EOD) robotics demonstration and received an engineering brief about aircraft ejection seats. They then toured the cartridge- and propellant-actuated devices (CAD/PAD) manufacturing facility and a detonation science building. The day ended with a behind-the-scenes look at the 420 gallon mixer and a question and answer session with several scientists and engineers working in the Energetics Laboratory. As the class traveled around the base, they were treated to a windshield tour by Becky D’Ambrosio LSM’17, director of Public and Congressional Affairs, and Mike Adams, business director for NSWC IHEODTD. Most of the Class of 2018 had never had the opportunity to see what goes on at NSWC IHEODTD. The day was both educational and inspiring and participants were left with a new-found understanding of the ways in which the defense and supporting industries in Indian Head critically impact our region. The class wrapped up the day with a networking event hosted by the LSM Alumni Association at Casey Jones in La Plata, Maryland. Class participants were able to meet and interact with LSM alumni, nearly 300 strong, to discuss the day’s experiences and lessons learned.